Fresh from a summit on social impact purchasing presented by Enterprising Non-Profits and their partners, my mind is overflowing with ideas and opportunities to explore. How does this concept differ from buying green products? It goes beyond the desire to reduce pollution and waste. Social impact purchasing looks at the composition and/or operations of the suppliers that we choose to work with and/or the products that they source to see what practices they’ve adopted to support and stimulate the local community. I’ve given a lot of thought over the last few years to the physical impact that major events have on their communities but hadn’t fully considered until now the legacy that we can create when we carefully consider how and where we choose to spend our budgets. Differentiate between discretionary/informal purchasing, which may allow managers more freedom to find vendors that offer value other than the lowest bid and formal purchasing which can be daunting to small and medium enterprises who are less familiar with the RFP process. There are some great businesses in my local area that have unique and amazing products that I would love to acquire for future projects. 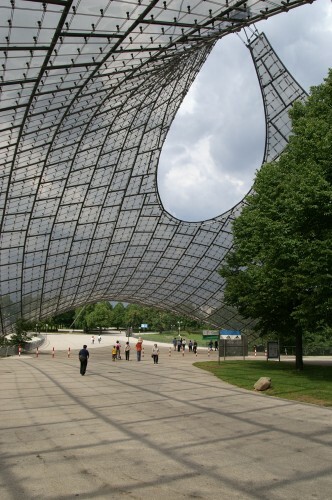 We’re inspired by images of space frames and tensile structures as we design a roof and enclosure for our latest sports project. Thought we’d share some of the knowledge that we’ve acquired in our research. We’re looking for ideas and suppliers – please contact us if you have catalogues or links to share. 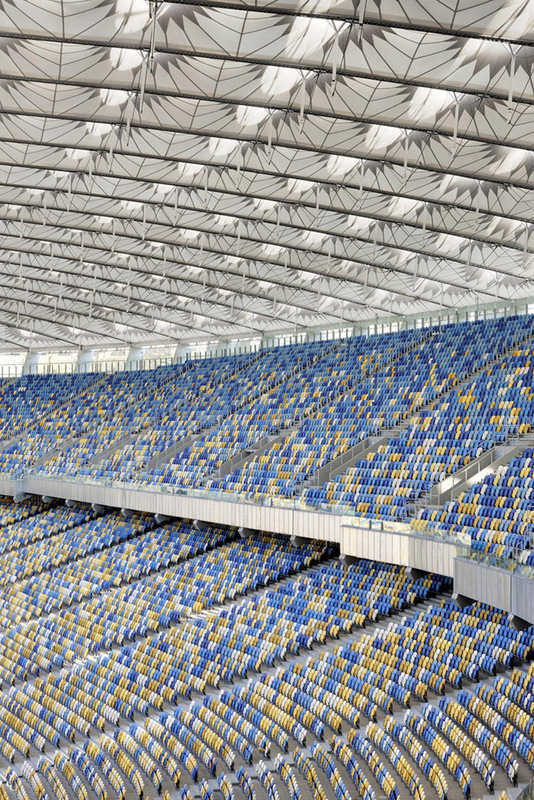 The Kiev Olympic Stadium is one of the many beautiful venues of the 2012 UEFA Championship. The roof, according to Hightex‘s, the roof manufacturer, is a ring cable structure which is composed of two outer steel compression rings, an inner tension ring and upper and lower radial cables. The membrane us a special laminated PTFE/ glass mesh membrane with high light transmission, and the roof will be divided in 80 individual panels totalling an area of approximately 48,500 sq/m. The final membrane form is achieved by a series of eight high points per panel. The high points are constructed using cables and flying masts. 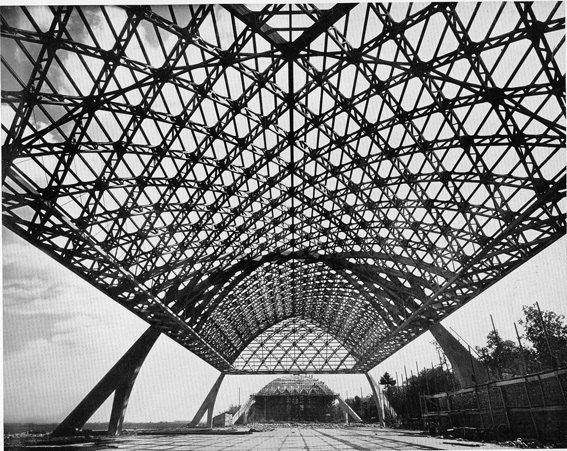 Nervi constructed a number of airplane hangers out reinforced concrete in Italy in the late ’30s. The first hangars were entirely site-cast while the remaining were prefabricated and strengthened on site with additional ribs in the areas subject to the greatest loads. 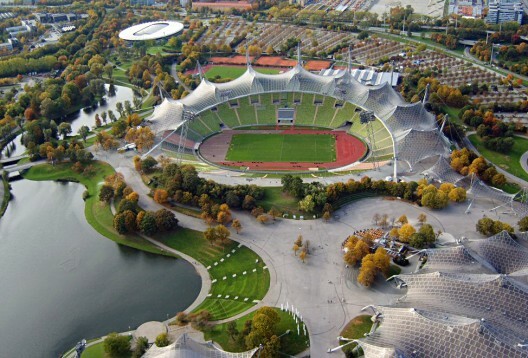 The Olympiastadion was originally constructed to be the main venue of the 1972 Summer Olympics. Most recently it hosted the final for the 2012 UEFA Women’s Champion League. Here’s a good reminder that claims made by the product manufacturers must be carefully evaluated. 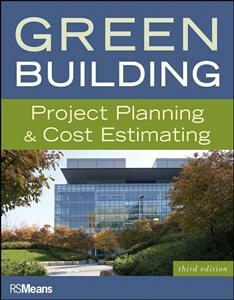 The following is an excerpt from Green Building: Project Planning & Cost Estimating, a book from RS Means, that I’m reading. “Claim 1: Sheet lead is a green product. When we requested information from product manufacturers, one of the first responses was from a trade organization from the lead industry. They maintained that lead was a green product because it was a natural material and had a successful history of long-term performance. They recommended we include lead in our list, but we didn’t. Is lead a green product? Do we accept the claims of the supplier, which include that there are very few, if any, EPA regulations against using lead in buildings? Or do we consider that lead content is regulated in commercial and residential paint products, as even small chips of lead paint are believed to cause brain damage in young children? Or that installers are required to regularly have their lead levels checked? Or that lead doesn’t migrate in the soil, and its use for hundreds of years verifies the manufacturer’s claims? [Their] Opinion: Lead is not acceptable in an elementary school or any location where a young child can touch it. Lead is not acceptable as a roofing material where water runoff will enter a watershed or other environmentally sensitive areas. As major producers continue to eliminate lead from their product lines, the choice will be made for us, and alternative alloys with tin and zinc will replace lead. Claim 2: Carpet pad manufactured from virgin urethane is greener than rebonded carpet cushion. Manufacturers of carpet cushion claim that less energy is required to manufacture carpet pad from virgin urethane than the energy and adhesives required to fabricate rebonded carpet pads. 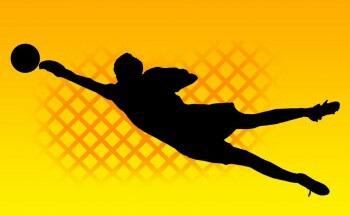 Should we only recommend the use of virgin urethane pads? [Their] Opinion: Virgin urethane pads have more uniform density. Don’t feel obligated to use rebonded carpet pads. Depending on your perspective, both may be seen as green. Claim 3: Latex paints are a greener choice than oil-based paints with higher volatile organic content (VOC) emissions. Water-based latex paints are considered greener than oil-based paints. However, manufacturers of oil-based paint claim longer service life and less repainting over the life cycle of the building. The cleanup of oil-based paints is controlled, while latex paint waste is frequently flushed down drains where the algaecides and fungicides in the paint kill the bacteria at the sewage treatment plant. Should we use oil-based paints? [Their] Opinion: Zero-VOC and latex formulations have advanced paint technology significantly. Since most commercial repainting is done for new tenants or a new color scheme, longer service life isn’t necessarily the determining factor. The choice may be made for us, as state and regional limits on VOCs are established. Claim 4: Linoleum is green because it is made of natural components. The last linoleum plant in the U.S. closed in the 1930s (as vinyl asbestos tile pushed it from the marketplace), and now linoleum is manufactured primarily in Europe. Should we count the embodied energy in manufacturing as well as the fuel costs of transportation in our product selection? The manufacturing process for linoleum is energy-intensive; is the extra cost worth higher wear performance? [Their] Opinion: Although an increase for the demand in linoleum has instigated manufacturing in the U.S. again, selection based on green criteria should include more than just the use of natural ingredients. It’s ultimately the designer’s choice. Claim 5: PVC is a green choice for roofing and waterproofing. Use of PVC for roofing and waterproofing in Europe is considered a hazard, but high-performing PVC systems are readily available in the U.S. PVC didn’t exist 80 years ago, but now each of us has a measurable amount of PVC in our bodies. Do we know the answer? [Their] Opinion: PVC roofing and waterproofing systems perform well and should be considered, as the intended purpose is to keep the building dry (to avoid all the material and health hazards of uncontrolled water in a building). But PVC contains dioxin which is a potent carcinogen, and associated with the manufacturing of PVC,as well as with disposal and accidental combustion in building fires or landfills. If your goal is to reduce the amount of PVC in your building, start on the inside rather than the outside with PVC-free flooring, wall base, casework, computers, pens, chairs, and furniture; yet without plastics, the planet could not sustain its current population. Claim 6: Forest Stewardship Council (FSC) certified wood is the green choice for your projects. There’s even a USGBC LEED point you can earn for using certified wood. However, certified wood in architectural species has thus far been available only at a premium price. Most of the certified forests are mid-sized, and not all species are readily available. The program is excellent, but critics, such as the Canadian government and others, believe they have been managing their forests for decades, and the wood they produce meets other sustainable wood programs without being FSC certified. On a recent LEED project, once it was determined that 50% of the wood would not be certified, the requirement was abandoned for the entire project. Note that the current LEED (version 2009 as of this printing) still requires a minimum of 50% FSC certified wood content for credit, but now includes prorated FSC Mixed Credit products within the calculation. [Their] Opinion: Why should only one certification agency be included in LEED? The Sustainable Forestry Initiative (SFI), developed by members of the American Forest and Paper Association, is one of several with legitimate credentials. The difference between “green” and “LEED” becomes more apparent. Identifying green products, just like defining sustainability, is an exercise in subjectivity. There are many different definitions of green,such as being 100% recycled and recyclable; using less energy in manufacture; improving the building users’ health through reduction in toxic materials; or employing more energy-efficient methodologies for heating, cooling, and lighting. I was at the right place, at the right time today, to divert slightly used electrical fixtures and hardware from going to a landfill. It was a small commercial unit that was being renovated so it was a really modest number of fixtures but it felt really good to know that for the cost of a partial tank of gas, a few phone calls and a few hours of my time, I was able to do my part in recognizing the impact that our individual actions are having on our environment. If I was able to make others around me think twice as well then it will have truly been an incredible act. Construction waste makes up such a big part of landfills so if you’re renovating, please plan to salvage what you can. Concrete, porcelain, rigid plastics, tile, lumber, metals, masonry, plastic, rock, carpet and insulation are among some of the materials that can be recycled, depending on your community. You may also want to consider donating the materials, furnishings and equipment that you’re replacing as others might find a good use for them; If you’re able start your demo with the intent to recycle or reuse, you’ll find that the rest – disposing of it – is not as hard as you’d think. It does mean taking a extra time to separate materials and deconstruct items rather than tearing them out but there are charitable organizations, stores and recyclers who can greatly benefit from or pay you for your efforts. Ten years later, the average cost of home renovations is $12,972. (Canada Mortgage & Housing Corporation). That’s five times higher than ten years ago – ridiculous! We are clearly knocking down walls and putting in ceilings at an alarming rate – or are we? What these numbers don’t reveal is who is doing the work. Most professional tradesmen will scoff at the DIY die-hard and insist on a difference in quality of work when comparing a home handyman and trades professional. However, some of the best home handymen have built rooms, barns and even houses that stood firm far longer than many paid-for tradesmen have managed to cobble together. All this is my introduction. I’m not really writing about whether it is cost-effective to do-it-yourself when building your dog house, or what factors to look for in order to ensure you are hiring a quality contractor. No – no matter who does the work, it is clear that you are spending a lot of money doing it. And sooner or later, you will be faced with a ‘lighting decision.’ What types of fixtures, IC or non-IC, 3-D mapping of lighting design, how many lumen, how many Kelvin? When did lighting become so complicated? The days of Thomas Edison’s incandescent light bulb are over. Long gone – and they’re never coming back. Did you know that in Canada, incandescent light bulbs are federally ‘regulated out’ by 2012? That’s right – those bulbs you have at home become illegal after your new year’s party is over in a mere couple of months! Don’t worry – you won’t go to jail. They are no longer allowed to be sold. That means you can keep what you’ve got, but you won’t find them in stores anymore. In fact, you probably haven’t been able to find them for several months already – most Canadian stores stopped buying them in the Spring earlier this year and if they are still selling any at all, it is their left-over inventory. The funny thing is that the original incandescent light bulb that Edison came up with was supposed to last forever. And it may actually last that long, despite today’s popular belief to the contrary. There’s at least one bulb in Southern California that has stayed on constantly for over 90 years in a row! So why don’t all incandescent light bulbs last so long? Well, it all started at a meeting on Christmas Eve in 1924 by the Phoebus Cartel – representatives from the big electrical companies of that time, including Osram, Phillips, Tungsram, General Electric, and Compagnie des Lampes. This discussion actually goes down a deep rabbit hole – allow me to just say that the lightbulb and the lighting industry is responsible for the concept of ‘built-in obsolescence.’ This is the reason you car, your fridge, and your printer has a limited lifespan, an artificial one in fact – it never used to be that way before the Phoebus Cartel meeting! Ok – coming back to our discussion – we are talking about lighting in your renovation. Sooner or later you will be faced with lighting utility, design and fixture options. However, in most cases you will not be thinking about the environment, saving on your electricity bill, or even getting some extra cash in your pocket from your lighting choices! In British Columbia, you don’t even have to build anything to get money for lighting choices. If you ‘draw in’ LED lighting into your new construction design drawings – or even a substantial retrofit! – B.C. Hydro will cut you a cheque for $1,000. And you don’t even have to build it afterwards! That’s because LED lighting gets you way over the 10% efficiency requirement over other, more standard options. In fact, there are now programs that allow you to entirely finance all your lighting by paying for the light fixtures and the installation (you can now hire a professional AND not have to pay for it!) from the savings in electricity, after you get your B.C. Hydro rebate. Actually, if you are located in another province or state outside of British Columbia, I haven’t researched all the rebates and incentives, but there will surely be some available. Ontario has them, and most U.S. states do as well. Even federal and local programs are available through-out North America. Look – typically the Canadian home may spend between $300-$500 in electricity from the lights. Dropping the electrical use by using state-of-the-art LED lights will save you anywhere from $100 to over $400 a year. In addition, you won’t have to buy more lightbulbs because LED’s last so long. The payoff to you is clear – and if there are ways for you to avoid paying anything at all? Well, why wouldn’t you want to know more? Here are some renovating tips from Natural Resources Canada. When you hire a contractor for your renovations, make sure he/she is familiar with energy-efficient lighting systems and can recommend design options that utilize the wide range of ENERGY STAR qualified products. Determine lighting needs and desired effect before renovations begin. Note the need for brightly lit workspaces versus leisure areas that are better suited to such energy-saving devices as dimmer switches and accent lighting. Use fluorescent or ENERGY STAR labelled compact fluorescent bulbs to retrofit rooms requiring lighting for more than three hours a day, such as kitchens and family rooms. Since CFL bulbs last an average of seven years, they are also perfect for hard-to-reach places. CFLs can be screwed into traditional lighting fixtures. Better still, in your retrofit plan, opt for lights or fixtures that are designed specifically to hold a CFL to get the most benefit for your bulb. If you are buying a new lighting system, consider buying a fixture that complements the lamp for the intended purpose. For example, when installing linear fluorescent lighting, insist on tubes marked T8 rather than T12. T8 lamps use 25 percent less power for the same amount of light output as a T12. Recessed CFLs should have a properly designed reflector, otherwise the light will be trapped inside. Create different effects with decorating tricks such as using linear fluorescents for indirect light or using efficient track lighting or valances with CFLs to create wall washes for a softer feel. For more information on the ENERGY STAR international symbol or tips on energy-efficient products, call Natural Resources Canada’s Office of Energy Efficiency (OEE) toll-free at 1 800 387-2000 or visit the OEE’s Web sites or ENERGY STAR’s Web site, or write to Energy Publications, Office of Energy Efficiency, Natural Resources Canada, c/o S.J.D.S. Ottawa, Ontario K1A 1L3. ‘Being an architect is not as romantic as the movies make it seem so you have to be passionate about your work” – isn’t that what we tell those who ask? So in search of passion and inspiration, I set off on an unchartered course to take control of my destiny, selectively choose the projects that I would work on and devote the better part of my daily life to doing something that would inspire me to make a difference. Someone likely told me that it wouldn’t be easy but like most entrepreneurs, I was driven and determined not to be one of the small businesses that statistically fail in the first year so head down, I pushed on. I had a niche market, a business plan and my first client – what else could I need? As it turns out, getting a business license and hanging my shingle was the easy part. Entrepreneurs, solopreneurs, mompreneurs, consultants, freelancers – no matter the title on the business card, the challenge is enormous, the reward, respect and satisfaction can’t be beat but the risks that you have to take to create the time and personal freedoms to chase your dream can at times be too great to bear. Oh and not to add to the pressure but economists say that apparently it’s up to us to turn things around! I make it through another day with the help of mentors, great business coaches, and “how to” classes but personally I’ve gained the most from networking and sharing resources with other *preneurs. I feel fortunate to have a large network of consultants, technicians and suppliers to reach out to but short of going through the Association’s directory line by line, I haven’t found an easy way to reach out to other architects. As the opportunities for work shrink, I find myself competing with “The Big Guys” and wishing that I had a way to connect with other small practitioners. Does my niche complement yours? Can we share plotting accounts to qualify for volume discounts? Can we share office space or Cad Technicians? Who’s going to the annual conference? Does someone have access to a boardroom where we could have a lunch and learn – I really miss those! I’ve created a virtual place for us to meet through an online community for small business owners, called Biznik. If you’d like to have informal discussions about how to survive and/or enjoy the path that we’ve chosen, post informal/formal events of interest to our unique community, go for coffee and ask questions without being bound by legislation, mandates or duty, sign up online for the Vancouver Design Professionals group. I hope that this will give us all the added support that we need to fulfill our dreams. Are you running your own business? Some days better than others? Join other Vancouver entrepreneurs on April 13th to watch “Shine” and share stories about what it means to be a small business. SHINE: The Entrepreneur’s Journey is a 26-minute short film produced by Biznik that reveals the elation, fears, dreams, and tears that accompany anyone on the entrepreneur’s path. Through intimate interviews with entrepreneurs, experts, educators and celebrated researchers, the journey of entrepreneurship unfolds revealing the challenges, pitfalls, rewards and successes of self employment. It’s free but don’t forget to rsvp as space is limited. Congrats to the Canadian Soccer Association and everyone who helped in the bid to bring the FIFA Women’s World Cup in 2015! We’re looking for help promoting a 100 Places to Remember our climate-change related outdoor exhibit and speakers’ series. 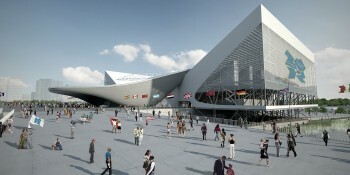 The project was extremely well received in Europe when it was first presented. It is now coming to N.America. We’d like to find a private investor(s) or organizations with a strong interest in sustainability who would like to sponsor the first exhibition that will be held in Toronto, in May, to celebrate UNEP’s World Environment Day. If you have experience working with organizations with a sustainability mandate please respond with a cover letter and resume. In your letter tell us about your experience in this particular industry and with event sponsorship.